There are two methods to use Driver Sweeper. Both methods achieve the same results. This method is always able to clean all files. Use the official uninstaller(s) of the driver(s) you want to uninstall. Reboot your PC in Safe Mode. Run Driver Sweeper and select what to clean. Analyse lists all the entries possible to remove, cleaning removes the entries selected. More drivers can be selected for the same cleaning process. The current supported drivers are NVIDIA (Display and Chipset), ATI (Display), Creative (Sound) Realtek (Sound), Ageia (PhysX) and Microsoft (Mouse). 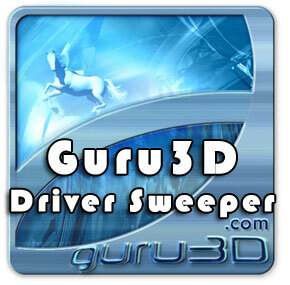 Driver Sweeper has been replaced with Display Driver Uninstaller. Download here. The current effect after you use this driver removal tool will be similar as if its the first time you install a new driver just like a fresh, clean install of Windows. As with any tool of this kind, we recommend creating a new system restore point before using it, so that you can revert your system at any time if you run into problems. We have an extensive AMD support thread over here and an NVIDIA over here. I would like to gather feedback from you guys. Tell me if it was success or not. For people with driver problem, if this tool gave you any success into fixing some issues your are currently experiencing, please share your result. Keep note that NVIDIA/AMD did not have anything to do with this, I do not work at or for NVIDIA/AMD and they should not be held responsible for anything that may go wrong with this application.